This is a fun way to eat fruit, and it is quite a crowd pleaser. 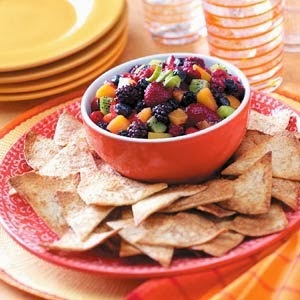 This fruity salsa can be served as an appetizer, a light dessert, or as a refreshing accompaniment to barbeque. Don’t be limited by the ingredients, choose your favorite seasonal fruits and enjoy. Mix fruit together with sugar and lemon juice. Cover and refrigerate. Cut tortillas into pie shaped wedges and arrange on a cookie sheet. Brush with melted butter and sprinkle with cinnamon sugar mix. Bake in the oven at 350 degrees for 5-10 minutes until crispy. Let cool and serve with the fruit salsa. If you want to get fancy, whip up a bowl of whipped cream to go with it.